Bob Stewart in the Radio Caroline North studio. Photo kindly provided by Carl Thomson. The British offshore stations were greatly influenced by American Top 40 radio and a number of local disc-jockeys tried to emulate the great US jocks by adopting a mid-Atlantic twang to their voices. But one English broadcaster's invented accent was so convincing that when Americans came to work with him on Radio Caroline, they would inquire which part of the States he was from. They were amazed to discover he was born and brought up on Merseyside! The man with the deep dark voice and the convincing accent was born Graham Robert Stewart in Liverpool on 3rd July 1939. A tall man - he measured 6ft. 5 ins. - he left school at 16 and became a car salesman. He went on to have a number of different jobs and spent his National Service in the Army, serving in east Africa. Bob Stewart multi-tasking - hosting a show and eating a meal! Photo from ‘Beatwave’ magazine. 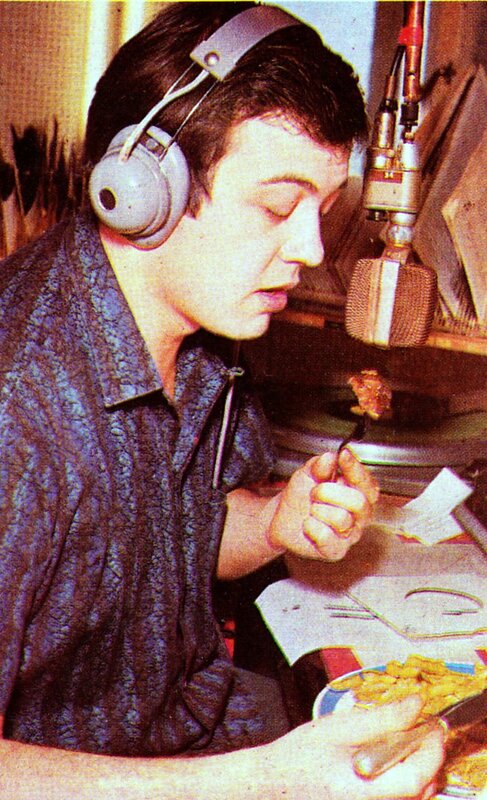 After leaving the army, a friend, Pete Best - the original drummer with The Beatles - suggested that Bob's deep resonant voice would make him an ideal disc-jockey. Bob took some convincing but Pete was right and Bob was soon spinning discs in a number of Liverpool clubs at the height of the Merseybeat boom. In 1965 he applied for a position with Radio Caroline and, after a brief stint on the South ship, was transferred to the North where he stayed for the next two years. It was while working for Caroline that Bob developed his new accent. The bosses were concerned that his natural Scouse tones might not go down well with some of the listeners, especially on the southern station, so it was suggested he try something less polarising. His invented American accent was such a success that Bob stuck with it for the rest of his career. It was also on Caroline that he became known as “Baby” Bob Stewart. He hosted a number of different programmes but is probably best remembered for his time presenting the 12-3pm show. In June 1967 Bob left Radio Caroline, about six weeks before the introduction of the law which would make it illegal for British citizens to work on the offshore stations. He returned to the Liverpool clubs but the following year was persuaded by his old colleague Tony Prince to apply for a job with Radio Luxembourg. “The Royal Ruler” was already working for Luxembourg and put in a good word for his former ship-mate with Programme Director Tony McArthur. He was in the process of putting together a new line-up of DJs, mainly consisting of ex-pirates, and Bob soon joined them. He was to stay with Luxembourg for nearly twenty years and, for many listeners, became the voice of the station. 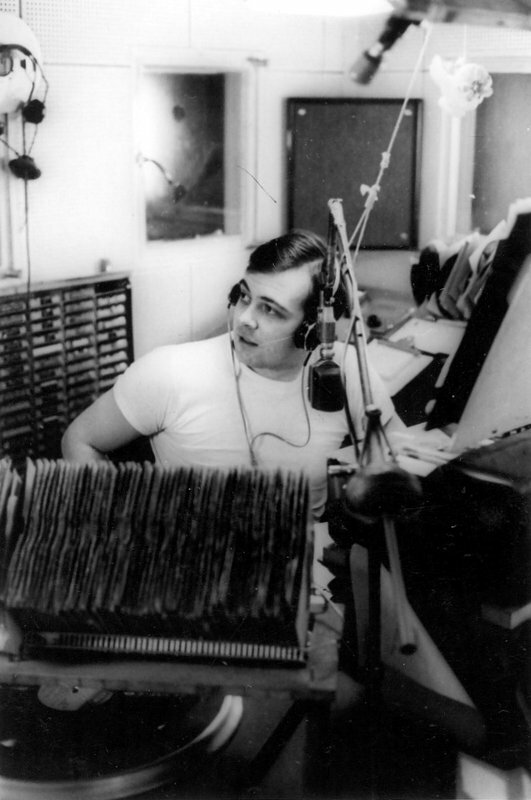 Bob Stewart in the Radio Luxembourg studio. Photo from ‘Radio Luxembourg: The Station of the Stars’, published by Comet. In the late eighties he and his second wife Cynthia moved to the USA but a couple of years later Bob was back on Radio Luxembourg where he stayed until RTL closed its AM service at the end of December 1991. He transferred to the UK and was heard on a number of stations including Jazz-FM, Red Rose Gold in Preston and London's Capital Gold. He and Cynthia then headed back to the USA, settling in Dallas, Texas. Unfortunately Bob's health was not good. He underwent surgery for cancer of the larynx, endured a bad car accident, suffered from Parkinson's Disease and had heart issues. Sadly he passed away at around 9am, local time, on 28th March 2019. He was 79. Bob's many years of service on Radio Luxembourg, and that station's wide coverage, means that he is mainly remembered for his time there but readers of this website will never forget “your Bobby baby who loves you so crazy” on Radio Caroline North. “Baby Bob was a very close friend on the North Ship and we still communicated over the years right up until his illness took him down. Memories from 1966: My first few hours on the North Ship were an experience. At 18 years old and on my first real ship the seasickness was a bit annoying. Bob came to my cabin, told me to go to the saloon and get a greasy egg sandwich down my neck. I did, and it worked. He also suggested a few Heinekens and that also helped. Later that night we all we gathered in his cabin and Bob fancied a shirt I was wearing (paisley green and red button-down collar). He said it looked so transatlantic he had to have it. Not a day on Caroline and Bob was buying the shirt off my back. (He later told me he wore it until it fell apart.) Back in those days Bob and I were about the same size. Another shirt followed a month or two later. It seems Carnaby Street just didn't have the Oxford cloth American style he wanted. 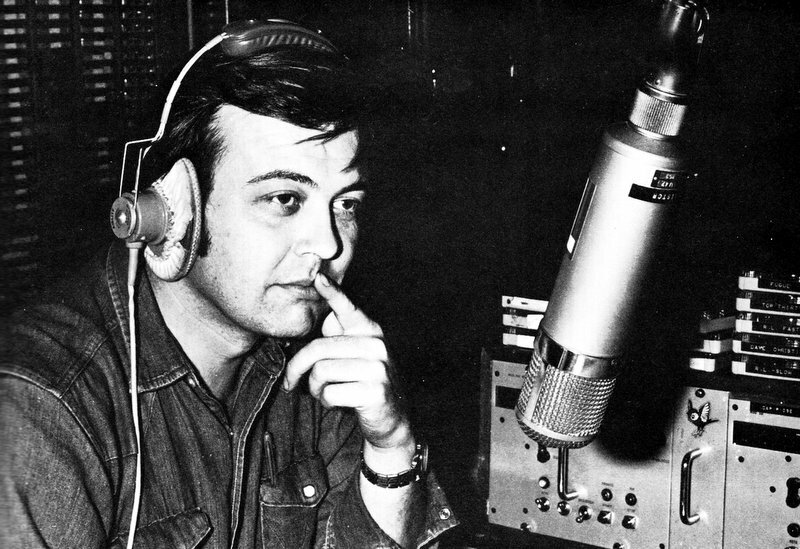 Through the winter of 1966-67 Bob and I would stay up very late at night discussing radio broadcasting in the USA and his desire to be a major player was burning hot even then. He asked me about his delivery - was it American enough? I told him for a non-native he was as close to a Yank as anyone I had heard. That pleased him. Baby Bob was a warm, funny, intelligent, sensitive and caring person. His interior was all heart and it was difficult for him at times to keep that from showing. Latterly we exchanged emails and talked of old times. He never lost the sharp edge and his dry wit was so great to hear in his banter back and forth. As we get older more of our old mates from Caroline will pass on. I was lucky to be so very young at the time maybe I will make it a few more years.